"I would like to say thanks for your great piece of software. I used to use my Takahashi NJP mount with its original hand controller which was rather limited and made finding targets on my CCD rather difficult but since I have upgraded to a stepper motor driven drive system controlled by STAR Atlas:PRO, deciding on and pointing to my imaging targets has been so easy and there is so much to choose from. I have used other Planetarium/Charting type software but I now use STAR Atlas:PRO exclusively for my imaging work." "I am highly impressed by your product, presentation and service - yours will be the standard that I judge others by. I do not pass out compliments lightly, in fact I am a perfectionist and a pain in the rear to many mortals!" In Tom's comments, following, Tom is referring to STAR Atlas:PRO's point & click Telescope Control System and the [Sync] and [Goto] commands. "this is brilliant, it's 6.47pm, the sky is still bright and STAR Atlas-PRO just slewed my telescope to half a dozen objects, all landed within the centre 2/3rds of the CCD Camera chip and produced useable images with only short integration times. Globulars, planetaries and random stars. STAR Atlas-PRO will save heaps of time for those people who want to get to an object quickly and concentrate on "doing their business". I flipped the mount over to the other side, did a [Sync] command and away I went. [Sync] is great, [Goto] is great. You've done very well !! " "STAR Atlas:PRO didn't just plot Comet Linear close to where I actually observed it, it was in-fact bang on target. Great stuff. Regards Scott Alder"
Excerpt from the Test Report that appeared in Sky & Space Magazine. (re-published with permission from SKY & SPACE Magazine). Loading the software up I was immediately struck by the amount of detail on the screen, the choice of symbols and colours is very intuitive. I immediately felt at home with this display. The software can be driven via the mouse or by entering keyboard commands such as 'Z' for “go to Zenith”. A simple pop up menu offers the control functions for the goto telescope mount including a command to “connect and let go of the mount”, so I could instantly jump between the AstroArt camera control software and STAR Atlas:PRO and vice versa. This is important, when using a guider like the Star 2000 your PC needs to be dedicated to the imaging/guiding task after STAR Atlas:PRO has positioned the scope. STAR Atlas:PRO's use of an onscreen menu of single word commands leads to very comprehensive command menus which are self explanatory. In combination with AstroArt camera control software using the mount with STAR Atlas:PRO makes the whole set up more like a robot connected via a cable. I have to say using STAR Atlas:PRO with it's GOTO controls to drive my Telescope becomes second nature very quickly. Users can tailor the type of information displayed on charts to suit their particular needs. Color printouts are a standard feature, but as yet I have not needed to printed a single page! STAR Atlas:PRO's screen display is so good I do not feel the need to add to the paper clutter in my workspace! Whilst I have been concentrating on the telescope control features of STAR Atlas:PRO, it is clear that the software has many other valuable features for astronomers who do not need the Telescope GOTO functions. "STAR Atlas:PRO is a first class product that I use myself and highly recommend to others. It doesn't have the clutter I've found in other products and the school teachers I've introduced it to have found it easy and fascinating to use." News Editor for SKY & SPACE Magazine. "If you need a charting program that performs exceptionally well, can help you plan your observations, will display data sets from various sources, is useable both indoors and outdoors, and is actively supported by its author, then you need STAR Atlas:PRO. It's that simple." "I have had the opportunity to read and absorb the how-to documents on your web site and I have found it to be fascinating and very helpful. When I first purchased STAR Atlas:PRO I could see great advantages in its use, but being a beginner in astronomy, I was unable to really utilise the many features of it. Since working through the many instructional documents on the web site, I have developed a greater understanding of astronomy and Star Atlas:PRO. I cannot begin to tell you how much data I have found ! I can now recommend the program to others enthusiastically as it will go on teaching me for many years yet. I commend it to other astronomers, both amateur and professional, and to beginners as well as more experienced users. There are so many facets to astronomy which this program introduced me to, I hope others will share in my discoveries. 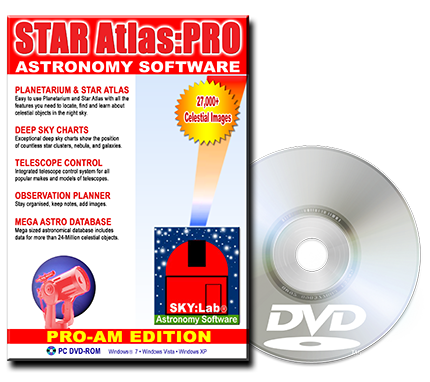 For all who use this exciting astronomy software, I wish you well and hope you have as much fun as I have had learning about STAR Atlas:PRO and Astronomy." "Enjoying STAR Atlas Pro immensely, especially downloading DSS images!".......... "Its an outstanding product, keep up the good work"